So, I compete in the Iowa State Fair food competition each summer, and I'm always looking for new ways to win. One way is to find classes in the competition that have only two or three entries each year. Less competition, better chance of winning. It sounds like cheating when I say it like that, but, what can I say? It's worked for me a few times. 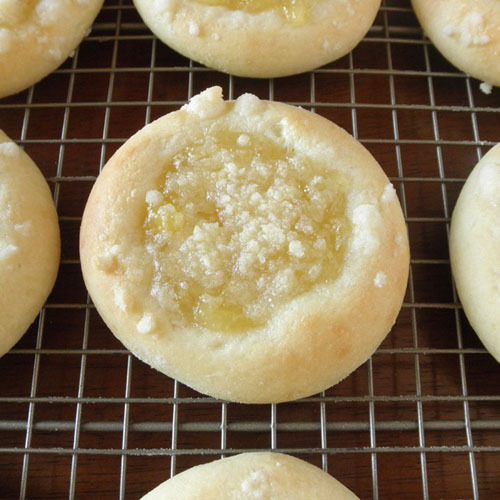 A couple of years ago, I was perusing the entries in the King Arthur Flour Yeast Roll Competition, and I saw these cute little danish-looking things, that I knew couldn't be danishes because they were too plain, and the dough wasn't laminated. I pulled out my handy dandy premium book for the food competition, and deduced that these were Kolaches. Hmmm. Fast forward a year or so, and I was having a chat with a colleague about food, and she mentioned a Czech pastry called Kolaches. She was kind enough to bring me one from back home in Saint Lucas, Iowa, where they have a Czech festival each year. It was a cherry Kolache, and it wasn't flat and round like this one, it was a little purse of dough, and there were four little "windows" of cherry filling. So cute. So tender and soft. Very nice. So, this year, 2011, I decided to try my hand at Kolaches for the IA State Fair. Since I'd never tried making them before, I just checked the sponsor's website, and of course, King Arthur Flour had a recipe for me. What you see below is pretty much copied and pasted from the website, but I've deleted some of the variations they list. What I got was a Kolache much sweeter than the one I first tasted, but the dough was the same, and it got me a blue ribbon in the Kolache class. Better yet, they also won second place overall in the yeast roll competition. Everyone who tries these loves them, so I'll have to try making them again, just to share. DOUGH: Warm the sour cream gently, and combine it with the sugar, salt, and butter or margarine in a large mixing bowl, the bowl of an electric mixer, or the bucket of your bread machine. Cool the mixture to lukewarm (if it isn’t already that temperature), and add the yeast (if you’re using active dry yeast, dissolve it in the water first), warm water, eggs, and flour. Mix and knead the dough, using your hands, a mixer, or a bread machine, till it’s soft and smooth. Transfer the dough to a lightly greased bowl, cover the bowl with plastic wrap, and refrigerate the dough overnight. Note: This dough won’t rise much, so don’t worry about having to put it in a huge bowl. Next day, remove the dough from the fridge, and divide it into about 20 pieces, each 1 3/4 ounces, about the size of a golf ball. Place the pieces on lightly greased or parchment-lined baking sheets, leaving about an inch between them. Flatten the balls till they’re about 1/2-inch thick, cover them with a proof cover or lightly greased plastic wrap, and allow them to rest for 10 minutes. PINEAPPLE FILLING: In a medium-sized saucepan, heat the drained pineapple to boiling. Cool to lukewarm before using. If you’re using cornstarch, mix cornstarch with the reserved pineapple juice. Stir the dissolved cornstarch and the sugar into the hot pineapple, and cook over medium heat, stirring, till the mixture thickens and becomes clear. Immediately remove the filling from the heat, and stir in the melted butter. Let it cool to lukewarm before using. STREUSEL TOPPING: In a small bowl, mix together the flour and sugar, then add the butter, stirring till crumbs form. Kolache right before going into the oven. ASSEMBLY: Using your fingers, make a wide, deep indentation in the center of each flattened dough ball. Don’t be afraid of being decisive here; you want to make a deep enough indentation that it doesn’t just disappear as the buns rise and bake. 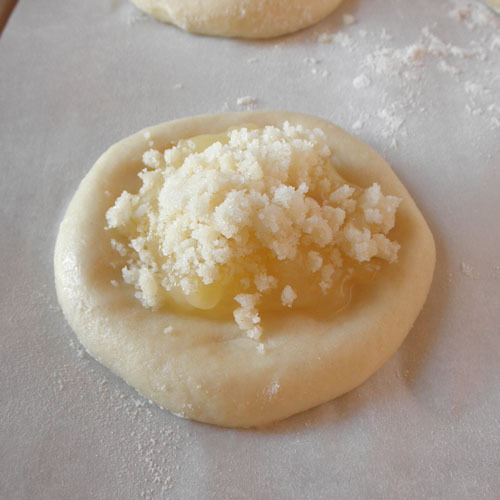 Place about 1 tablespoon of the filling into each bun; crumble a little of the streusel on top. Cover the kolaches, and allow them to rise for about an hour; they won’t necessarily double in bulk. Bake the kolaches in a preheated 350°F oven for 15 to 20 minutes, till they’re golden brown. Remove them from the oven, and serve warm, or at room temperature. you have to make these again. i'm in love with them and i haven't even tried them yet.